Reincarnation, someone? Maybe not, but when you listen to the album »Introducing Shoutin' Red«, it is kind to hard to understand how a 24 year young woman from Sweden can sound like a contemporary version of Memphis Minnie? On her debut album Shoutin' Red performs 12 classic/obscure blues and folk songs. She's spent hours, days, weeks listening to the old recordings. Then even more time practising and rehearsing and make them her own. Then as much touring and gigging as possible and eventually she found her own voice; her own way of appraching the songs. She's not trying to modernize the songs, on the other hand she's not keen on reproducing the original versions. 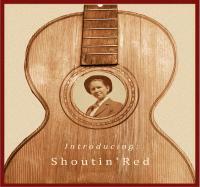 »Introducing Shoutin' Red« got a timeless quality and the old songs sound just as relevant today as a century ago. Shoutin' Red has been touring all over Sweden for a couple of years, and in 2013she was invited to Centrum Fort Worden in Port Townsend, USA, to participate in a workshop with some of the leading blues players today. After the workshop she travelled to Clarksdale, Mississippi where she played several juke joints and clubs. »Introducing Shoutin' Red« was recorded and produced by the legendary drummer Bosse Skoglund. Skoglund played with jazz greats like Lars Gullin already in the late fifties and he's one of the most respected Swedish musicians of all times.